It's a historical moment for the Wawasee Area Conservancy Foundation as a long journey to purchase critical property on Lake Wawasee has closed a chapter. But it opens up the possibility of new chapters. Those were the thoughts of Tom Yoder, WACF acquisition chairman, on the purchase late Friday afternoon of the "buildable lot" adjacent to the foundation's educational center. This purchase of close to 2 acres, includes 320 feet of lake frontage and 690 feet of channel frontage. WACF now owns 562 feet of lake frontage at this location on Lake Wawasee and close to 46.21 acres next to one of the largest remaining wetlands on the lake. Wawasee Area Conservancy Foundation closed the deal on the purchase of approximately 2.04 acres late Friday afternoon adjacent to the WACF Educational Center. The newly purchased property is shown in yellow, while the green colored area show the existing WACF property at that location. The purchase, from Hugh and Jackie Dunithan. 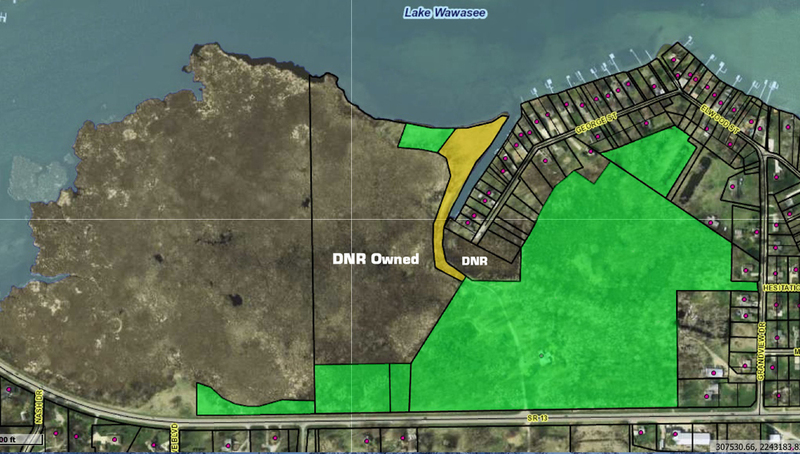 This purchase now gives WACF 562 feet of lake frontage at this location and close to 46.21 acres next to one of the largest remaining wetlands on the lake, Conklin Bay. The two parcels shown owned by the DNR was deeded to the state agency in a court settlement. The property was purchased from Hugh and Jackie Dunithan. Yoder noted he began talking with the owner of the property in 2002 and purchase of a part of the property c around 35.5 acres c took place in January 2008 at a cost of $1.15 million according to county records. "The owner retained the buildable lot," he stated, but no home was ever built on that property. DNR owns the neighboring property adjacent to the Conklin Bay wetland, deeded to it in a court settlement a number of years ago. Heather Harwood, WACF executive director, called the purchase a historical event. "It's really over the top," she noted in relation to the excitement of the purchase. "It's so important to the conservancy from the standpoint of being so contiguous to the main wetland area still left on the lake," Yoder stated. "Preservation of what's left is really important. The conservancy has a vision of educating and we see many opportunities in the future to use the lake frontage and wetlands around it to educate children and adults, boaters and all recreational users of the lake for everybody's greater appreciation to preserve and protect this great resource," stated Yoder. Sam Leman, WACF president, echoed Yoder's comments adding he is looking forward to what the foundation will be able to do in the realm of educational programming. "We are at the mercy of our benefactors," he noted, adding with the help of benefactors "we can come up with all types of educational programs." John Holdeman, immediate past president of WACF, summed it up in one word "Wow." Recalling when the property was first put on the market as a buildable lot, there was concern by the WACF who took the stand of being patient. That patience included doing a lot of time in discussion and thoughts of the "what if's" if there was a buyer for the land and who decided to build on the lot. Holdeman stated he and Yoder attended the land auction when held and while the price for the property went lower and lower, it didn't get to "our number. We didn't bid either. We always looked at this as it was something we needed to do to complete the preservation of Conklin Bay." "It gives me great satisfaction," stated Holdeman, joking the only thing better was for it to have been announced at the annual meeting. "It's a great accomplishment. It was a job well done (by Yoder) and he worked awful hard on this and used his advisors and the ability to buy the piece of property we had first and do the things we did is from the terrific donations (Ruddell family) that made it possible. I hope others step up and help with this piece of property as well for our future." Hardwood, who noted plans are still in the works for the facility, also indicated the property will be used for educational purposes and also as a welcoming area for those on the lake. She indicated while there could be boat docking available to use the educational property, the shoreline could provide means to show conservation efforts and programs available to those on the lake. "We are planning to use the property as an educational and welcome center to be interactive with the lake property," she stated. Continuation of making the trails user friendly and further each trail's development is part of the plan.